The Hotel Villa Grazia , three-star hotel in Cesenatico, which has a furnished garden, air-conditioned rooms and services such as excursions inland, parties and entertainment for adults and children. It admits small and medium-sized pets. This hotel adheres to the Green Booking project and has decided to donate a tree to the coast for a healthier environment and more sustainable tourism. The hotel is located in Cesenatico in a quiet and central area, close to the beach and 15 minutes walk from the Leonardo canal port. Nearby there is also the park of Levante equipped with relaxation areas and areas for doing sport activities. The rooms have WI-FI, satellite TV and digital TV, safe, telephone, private bathroom with shower and hairdryer. Air conditioning with charge. ALISEO : beds with beech slats, bathroom with hairdryer and shower with hydromassage jet. MISTRAL: LED TV, Sky TV and minibar. GHIBLI: more spacious than the Mistral with minibar, bedroom slippers, cosmetic mirror, Sky TV, DVD player, afternoon review, drink and welcome gift, fresh fruit basket in the room and your favorite newspaper every morning. 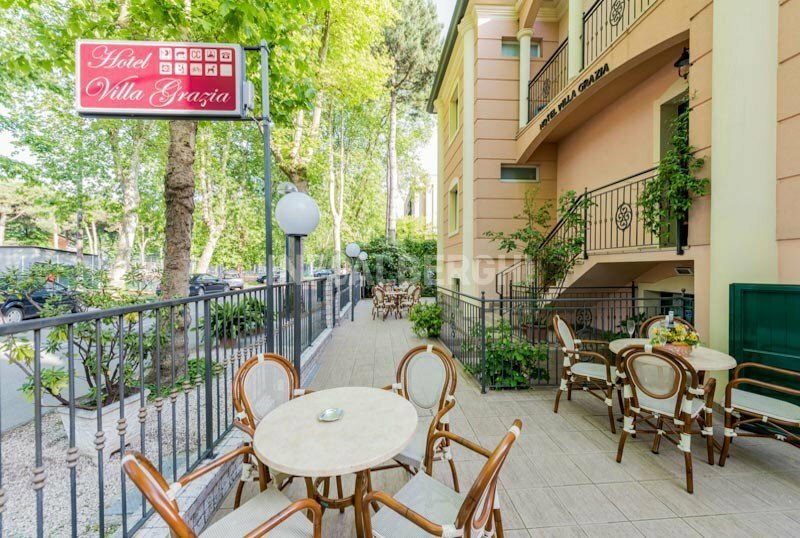 Outdoor area equipped with tables and chairs, free bicycles, solarium terrace, bar area, satellite TV room, pay laundry service. Theme nights are organized. AIR CONDITIONING: available in the common areas at no additional cost, in the room with a supplement of 6.00 euros per day. AGREEMENTS: beach, amusement parks, gym, swimming pool, waterslide. For a fee: guided tours of the historic center and the canal port of Cesenatico, the Saline di Cervia, the Hippodrome and the Romagna hinterland. BREAKFAST: buffet available until late morning with a choice of sweet, savory and dietetic dishes. LUNCH AND DINNER: menu with choice of meat, fresh fish, Mediterranean, Romagna and dietetic recipes, accompanied by rich vegetable buffets and a wide selection of wines. CHANGES: vegetarian, vegan, celiac and other intolerances. In the menus it is always possible to consult the list of ingredients and allergens used. OTHER: once a week traditional Romagna dinners are organized. In the hotel: outdoor playground area, strollers and bicycles with seats, baby library and video library. Upon request and payment: baby sitter and pediatric consultancy. In the room: cribs, sides, changing table and night light. At meals: high chairs, complete set for the table, bottle warmer, bibs, dedicated menus and baby food service. On the beach: playground area, nursery and entertainment. The structure has an agreement with the Bagno Bianconero establishment n. 29 equipped with sunbeds and beach umbrella rental, hot and cold showers, playground, relaxation area, bar and restaurant, WI-FI connection, daily entertainment, baby park, nursery, bottle warmer and microwave available. Prices are per day and per person, inclusive of VAT and breakfast (drinks not included). - All offers are not cumulative and are valid for min. 2 people. June week only if with two paying adults in the room 1 child FREE up to 15 years all inclusive. 7 days in full board € 385.00 per person. Contact us now and come and discover all the services of your holiday!